The MCP3424 is a four channel low-noise, high accuracy delta-sigma A/D converter with differential inputs and up to 18 bits of resolution. The on-board precision 2.048V reference voltage enables an input range of ±2.048V differentially. The device uses a two-wire I2C™ compatible serial interface and operates from a single power supply ranging from 2.7V to 5.5V. The MCP3424 device performs conversions at rates of 3.75, 15, 60 or 240 samples per second depending on user controllable configuration bit settings using the two-wire I2C™ compatible serial interface. The I2C™ address is user configurable with two address selection pins. This device has an onboard programmable gain amplifier (PGA). User can select the PGA gain of x1, x2, x4, or x8 before the analog-to-digital conversion takes place. This allows the MCP3424 device to convert a smaller input signal with high resolution. The device has two conversion modes: (a) Continuous mode and (b) One-Shot mode. In One-Shot mode, the device enters a low current standby mode automatically after one conversion. This reduces current consumption greatly during idle periods. 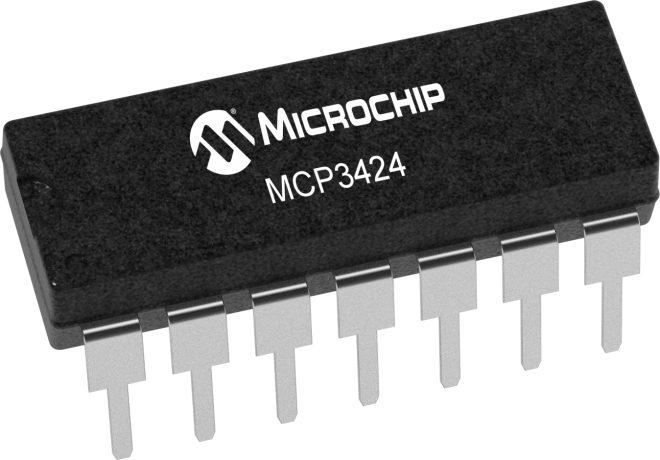 The MCP3424 device can be used for various high accuracy analog-to-digital data conversion applications where ease of use, low power consumption and small footprint are major considerations. The MCP3424 EV Board is a quick and easy evaluation tool for the MCP3424 18-bit four channel Delta-Sigma ADC device. It works with Microchip's popular PICkit™ Serial Analyzer or independently with the customer's applications board.